The rollers at A.J. Fernandez's new San Lotano factory in Nicaragua are very busy. Formerly the San Rafael factory, Fernandez purchased the facility last year and renovated the space to meet his production needs. 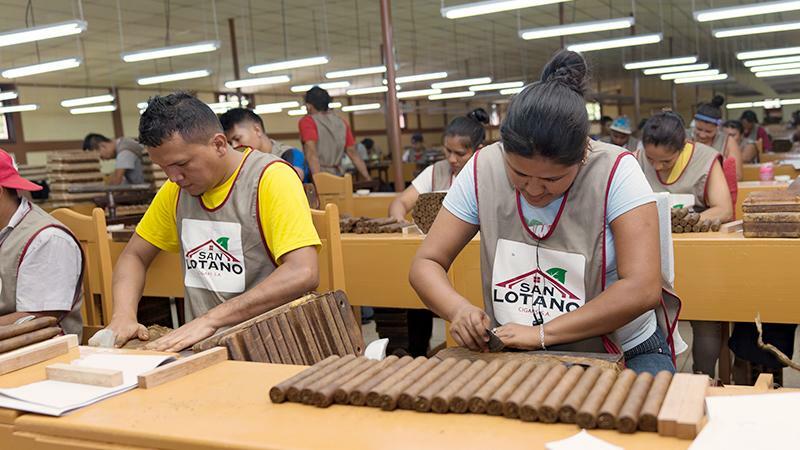 Now that the new factory is up and running, it's producing a variety of cigar lines, including the entire high-volume portfolios of Man-O-War and Ave Maria (catalog brands owned by Cigars International), Enclave Broadleaf, Free World and Dias de Gloria. San Lotano is also producing contract brands such as 601 and Murcielago for Erik Espinosa. "I am very happy because in a very short time the production has increased exponentially, and grows on a daily basis," said Fernandez of his new factory. "We are always acting with social responsibility bringing work where it is needed and supporting the community that was previously unemployed." The 117,000 square-foot factory currently employs 118 rollers, or 59 pairs (bunchers, rollers). But Fernandez told Cigar Aficionado that it has the capacity for 240 rollers, or 120 pairs. He opened the new factory in Ocotál because his Tabacalera A.J. Fernandez Cigars de Nicaragua factory in Estelí is at maximum capacity and he needed the new facility to meet growing demand. The former San Rafael factory was owned by Fidel Olivas and produced the El Baton and Brick House brands for J.C. Newman before the company moved the cigar lines to its own factory. Fernandez said that the facility was in fairly good condition when he bought it, but required some remodeling to look and function more like his factory in Estelí. "Ultimately, that brings me the greatest joy," Fernandez said. "Seeing the hard-working people of Nicaragua able to prosper, as they have helped me prosper in this industry which I love." This article first appeared in the February 21 edition of Cigar Insider.